Take the time to develop your investment program thoroughly. As with any plan, you will need to monitor and possibly modify it on a regular basis due to changing circumstances. The safest way to make money in real estate is through prudent and cautious investment. Don’t look upon real estate as a get-rich-quick scheme. There are many who adopted that attitude–to their misfortune. Be wary of U.S.-oriented real estate investment programs. In many cases, they may not be directly applicable to the Canadian context, due to differences in legal and tax matters. Some others may be borderline on their ethics. 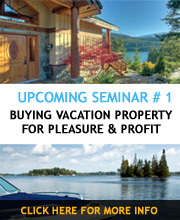 Some real estate seminars and books promote the concept of becoming rich through property tax sales, foreclosure sales, quick property flips, and the selling (assigning) of the agreement of purchase and sale before closing. In Canada, extreme caution is advised, as these options are not always applicable, or they are applicable only with considerable difficulty and risk. Money can be made in real estate through informed and cautious application of basic principles, formulas, and systems. The following is an outline of some key real estate investment strategies. Thoroughly research the market before any decision is made. Have at least three potential properties if possible. Give yourself a realistic timeframe in which to realize your investment objectives. For example, normal real estate cycles are five to eight years, and in some cases 10 to 12 years. Buy specific types of revenue property that are in demand and are easy to maintain and/or manage (for example, a single-family house–ideally with a basement suite for separate revenue, a condominium, duplex, triplex, or fourplex. Don’t buy an apartment building until you have experience as a landlord with several smaller properties, unless you are going in with experienced investors. Attempt to put down a low down payment (for example, 10 to 15 per cent). An exception of course would be if your comfort level was a maximum of 75 per cent financing. If you have a low down payment it frees up your available cash for other properties. Compensate for the low down payment by having a vendor take-back mortgage, high ratio of financing, or second mortgage. Strive to have a break-even cash flow. In other words, try to avoid debt-servicing the property because of a shortfall of rental income. Make sure you cover all expenses from cash flow such as mortgage payments, taxes, property management, condominium fees, insurance, repairs and maintenance and allowance for vacancies. Be very cautious about going into group investments. If you do, get objective advice from a real estate lawyer and professional tax accountant before you commit any money. Ask about the risks and protections. Use professionals at all times. Tap into their expertise for your peace of mind, enhanced revenue potential, and reduced risk. This includes carefully selecting a lawyer, accountant, building inspector, appraiser, contractor, realtor and property manager. Professionals will also help you in establishing realistic projections. Never pay more than “fair market value”. Use tax laws to the maximum. Keep rents at market maximums and manage expenses to keep them at market minimum. Always view and inspect before you buy. Verify all financial information. Obtain your advisors’ guidance. Have a minimum three-month contingency reserve fund for unexpected expenses such as repairs or a reduction in cash flow (vacancies). Consider applying the principle of “pyramiding”, or purchasing selected real estate on a systematic basis. For example, you may purchase one or two properties a year when the cycle is in your favor.